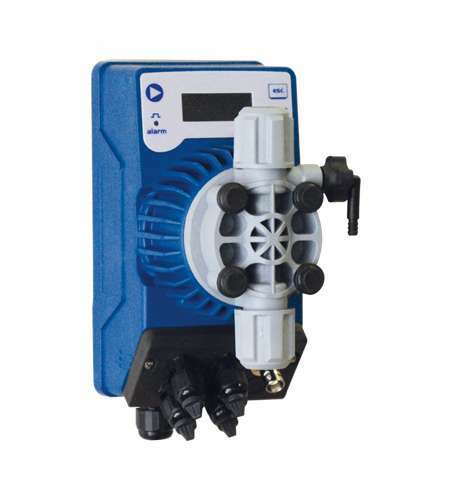 A versatile, multi-model solution within the SEKO solenoid dosing pumps range, the wall-mounted Kompact series is ideal for cost-critical applications with small delivery requirements such as chemical dosing systems for swimming pools. Among the energy-saving features of the Kompact chemical dosing pumps range is a stabilized multi power supply, which draws the precise quantity of power required to activate the pump. This optimizes efficiency and ensures power supply fluctuations do not jeopardise performance. Kompact is built with the superior components you expect from a SEKO product, including ceramic ball valves, PTFE diaphragm and PVDF-T pump head (PVDF optional). This delivers exceptional chemical compatibility with wetted parts for outstanding life expectancy and reduced maintenance requirement. Analogue dosing pump with constant flow rate with manual adjustment using the control dial on the front panel with two frequency ranges (0÷20% or 0÷100%), Power-ON LED indicator and level control input. Analogue dosing pump with constant flow rate with manual adjustment using the control dial on the front panel. Power-ON LED indicator. Constant flow rate manually adjustable, with proportional flow rate according to an external analogue (0/4 - 20 mA or 20 - 4/0 mA) or digital signal (water meter, hall sensor or voltage signal). Constant flow rate manually adjustable, with proportional flow rate according the measured pH or Redox value.